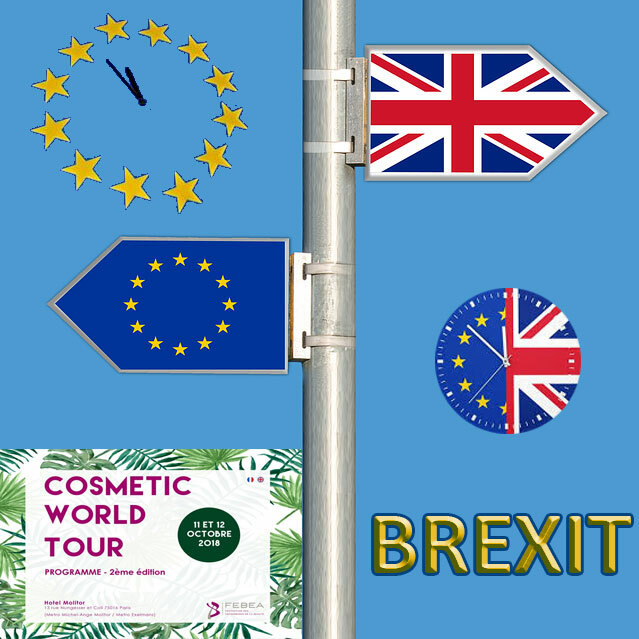 Home Articles News Congress reports Brexit in practice: what to be prepared for… now! On either side of the Channel, the arrival of the Brexit, and the uncertainties surrounding it, continue to worry. As a “Hard Brexit” (an exit of the United Kingdom from the European Union without an agreement) is less and less excluded, it is high time for companies to prepare for the cut-off date of 29 March 2019. This was the message delivered by Virginie d’Enfert of the French FEBEA, Emma Trogen of Cosmetics Europe and Olivia Santoni of the CTPA (Cosmetic, Toiletry and Perfumery Association) during the 2nd Cosmetic World Tour organised by the FEBEA on 11 and 12 October 2018. And this does not only involve companies that sell their products in the United Kingdom, but potentially ALL cosmetic companies! Before talking about Brexit, it is worthwhile to understand exactly which entity decided to leave Europe. Is it Great Britain, the United Kingdom, England…? Well, what is there really on the other side of the Channel, at the end of the Eurostar? • There are two main British Isles: Great Britain and Ireland. • Great Britain includes several countries: England, Scotland and Wales. • Ireland is divided between the Republic of Ireland and Northern Ireland. • The United Kingdom is a country that includes several countries: England, Scotland, Wales (Great Britain) and Northern Ireland. And while the borders are flexible between all these countries, they remain borders… the most sensitive of which is the one that separates the two Ireland… the very one that could separate the United Kingdom from the European Union after Brexit. Let’s see it in pictures….